About Turmric Turmeric is a rhizomatous herbaceous perennial plant of the ginger family. Problem Description Several spots appear on the leaf surfaces. Several spots appear on the leaf surfaces. Initially these are pale yellow not sharply defined from the rest of the tissue and change to dirty to deep yellow with time. 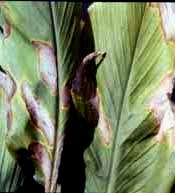 Infected leaves are distorted and attain yellowish to reddish brown appearance.